Love and respect from my daughter helped me to understand why, in turn, God loves us. It is a curious thing, if you actually stop to think about it. Why would a being as supreme as God have any interest in us at all, let alone love us fondly? Aren’t we – both individually and collectively – so insignificant as to be something of such little value or meaning as not to be worthy of his focus at all? That’s a question we seldom dare ask, let alone try to answer. 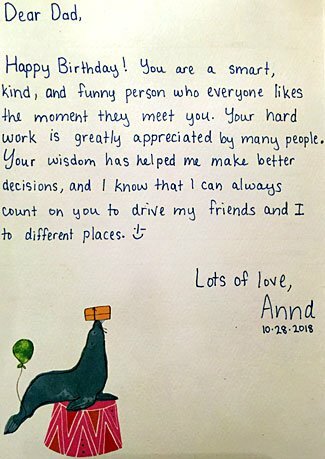 But (and to switch to the personal for this article, if I may) I recently had my latest birthday, and received a birthday card from my 14 year old daughter (copied on the left) that filled my heart with a joy quite unlike any of the assorted gifts she and others kindly gave me. I was thinking about this, happily and thankfully, while taking our dog for a walk this morning. Between the two of them, and their examples for me to learn from, both dog and daughter gave me some clues as to why God loves us all. Like most parents, I love my daughter very much, and have from the instant she was born. My love for her, both at the instant of her birth and always subsequently, has never been an earned love, it has always been a natural love. I have loved her for what she was and is, and for what I hope she will become. I have tried to guide her, and sometimes have had to correct her. Of course, now that she is a teenager, I’m also slightly anxious as to how the next few years will unfold, but what can I do other than to lead by example and offer such advice and counsel as she may hopefully choose to accept? Ultimately, she is her own person, and will make her own choices. Sometimes she behaves to a very high standard, and sometimes, she does things that disappoint me. But (and like all parents) steadily, all the way through, my love for her is constant, and I am always there to help and assist her, even though sometimes the help and assistance might not take the form she thinks is best for her. Sadly, if she should make bad choices, she’ll have to accept the consequences of those choices, and my love for her could not spare her from such things. When she displays an unprompted and sincere expression of appreciation and love in return, my heart fills to overflowing with joy. Now, think about this – isn’t this just like God’s relationship with us. He has always loved us, and when we love him back, that fills him with great joy, too. He has tremendous hopes for our future, and has done all he can to guide us in the correct direction, but he realizes that we must make our choices, ourselves, and if we freely make the wrong choice, then we and he both have to accept the consequence of that mistaken choice. Of course, when we ask for his help, he gives it, although not always in the exact form we might expect or wish for. A picture of our dog, taken by my daughter. Which brings me to my dog. I’ve owned dogs for decades, and have loved them all. I remember, as a little boy, being so upset when my first dog displayed greater respect/interest in my father than in me, but learned the lesson that we can’t force dogs, any more than we can force people, to love us. Love and respect is only meaningful if freely given. Sometimes my dog is naughty. I’ve cleaned up more messes than I’d wish for. Sometimes I’ve had to discipline the dog, or to discourage her from doing things that come naturally to dogs (such as barking at delivery people!). And sometimes I’ve had to care for her in ways she surely doesn’t understand. One dog needed knee surgery – she had no idea at all why it was she went to a dog hospital, and emerged the next day with a very sore leg and feeling unwell from the anesthetic. Currently, I’m having to administer eye drops and ointment to my dog, and I’m sure she views this as unnecessary torture, twice every day. 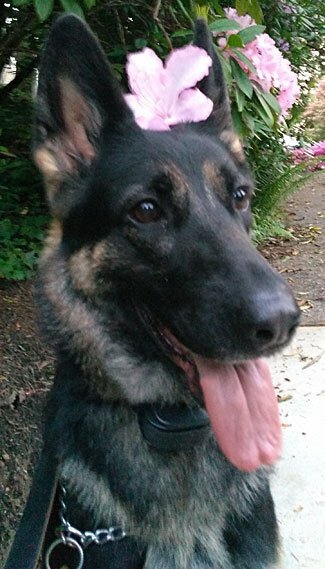 Of course, I don’t love my dog any way at all like I love my daughter, and whereas I hope my daughter will outlive me by decades, I’m already anticipating the end of this current dog’s all-too-short life. But I do love my dog, very much indeed, and when she acts well and responds positively, she too fills my life with happiness. Isn’t this again similar to how God views us? Sometimes it seems he tortures us gratuitously, and for no good purpose; but just like a dog has no idea why we administer medicines and perform surgery on them, why we allow them to eat meat but not chocolate or onions, and so on; we too have no inkling of the greater good and purpose the Lord has for us and why he gives us the experiences we have. Our dogs can never relate to us on any sort of equal level. We could never have a conversation with them, or play a game of cards with them, and 99% of the time, we are helping them rather than them helping us. But we love them all the same, and similarly, God’s awesome might is something we can only struggle to comprehend, but he still loves us, even though we’re so much less than he is. So, just as we understand the normal concept of our love for our children and our pets, isn’t it easy to see a similar love from God to us? We should accept and embrace his love for us, and accept that sometimes the things he lovingly causes us to experience – things which may seem terrible and tragic to us – are expressions of his love and care for us, and are indeed for our broader benefit. Dear friends, please join with me and rejoice in God’s saving love for us all. Please allow that love to wash over you, and to flow on to the people around you, both friends and strangers, in equal measure.